IR Camera Market size was over USD 3 billion in 2015 with 9.5% CAGR estimation from 2016 to 2023. Increasing demand across verticals including military & defense, and industrial is anticipated to drive the IR camera market size in the coming years. 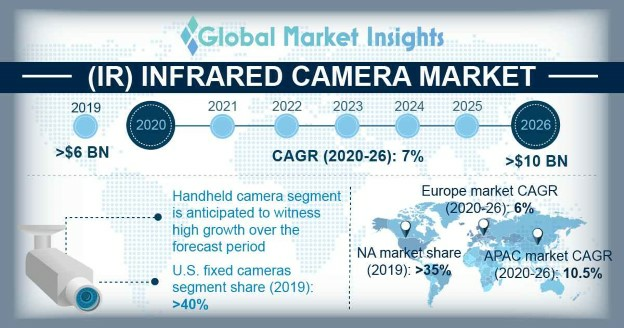 Growing integration of advanced thermal cameras in smart mobile devices such as smartphones and commercial applications coupled with the declining prices of thermal cameras is anticipated to boost the industry growth. Moreover, the high demand for security and surveillance cameras with enhanced resolutions across the military & defense sector provide several opportunities to the IR camera market size. IR cameras provide innovative features such as iron palette, black/white/gray palette and rainbow palette that are increasing the adoption rate. Rainbow palette offers advance thermal sensitivity to display the differences in temperature. Avio Infrared Technologies introduced R300S high thermal sensitivity imager for energy audit, building inspection, geology, civil engineering and veterinary with rainbow palette. In addition, high-end products include color alarm feature that allow user to select temperature accordingly, which in turn increases the customer satisfaction. Furthermore, innovations have boosted efficient features such as built-in visual imaging, and automation. Growing demand in areas such as detecting electrical defects, assessing moisture, and plumbing blockages & leaks identifications may further contribute to the IR camera market size. Moreover, increasing consumer application such as personal vision for radiometrics may increase the revenue. Reduced prices of Long Wave Infrared (LWIR) camera will upsurge applicability in automotive and security industries. Decline in military & defense budget may pose threat to the market growth. In addition, lack of efficiency to see through glasses may negatively impact the revenue over the forecast timeline. Military & defense IR camera market is forecast to cross USD 2.4 billion by 2023 owing to the rising security concerns. Increasing demand for rugged products coupled with reliable and temperature tolerance across the globe is anticipated to boost the segment demand over the future. Moreover, increasing investments in defense sector from countries like Asia Pacific may further contribute to industry growth. In addition, ability to detect faults in process control, equipment and quality control will further lead to the increase in adoption over the forecast period. Commercial IR camera market share is projected to grow at a CAGR of over 10% from 2016 to 2023 owing to various applications across fire & rescue mission, security & surveillance, thermography and night vision. The medical imaging segment is anticipated to witness significant adoption over the next few years. Rising demand in hospitals to detect threatening diseases such as cancer or tumors impel IR camera market adoption. Germanium segment accounted for considerable IR camera market share in 2015 and is expected to continue its dominance from 2016 to 2024 owing to advanced mechanical properties. In addition, it is made up of non-hygroscopic material which makes it a good transmitter of infrared radiations. Capability to provide improved carrier mobility and high nonlinear coefficients may drive the infrared camera market in the near future. Zinc selenide IR camera market size is expected to observe substantial growth at over 10% CAGR from 2016 to 2023. The ability to offer solid resistance to thermal shock is expected to augment its adoption in medical imaging over the forecast period. North America, through U.S. IR camera market size led the global revenue in 2015 and is expected to continue dominating the industry over the forecast period owing to the presence of majority of established players. Rising demand from video surveillance cabling and infrastructure sector is anticipated to drive the regional demand. Moreover, effective mass screening to detect individuals may add an advantage to the region’s growth. Asia Pacific IR camera market share is projected to witness significant growth from 2016 to 2023. Growing investments in defense sector and high demand for security and surveillance are the factors driving to the regional revenue. Increasing demand across oil & gas and automotive application is expected to increase the demand. Key industry players include FLIR Systems, DRS, Axis Communications, Samsung, Fluke, and Seek Thermal. Other notable players include Raytheon Company, Testo AG, etc. Industry participants are engaged in price reduction, product performance & reputation, customer service and training to enhance the industry presence. Mergers & acquisitions are among the key strategies for expanding IR camera market share. Advances in the infrared-imaging technology may drive the industry in the coming years. Manufacturers in the industry are engaged in the mass production of IR cameras to increase the profit margins. For instance, ASELSAN began the mass production of the eye of thermal cameras that can detect heat in the premises. Developments in the microbolometer technology has resulted in high degree of commercialization that is contributing to the IR camera market size. Moreover, ability to capture images and video due to IR LEDs around outer edges adds an advantage. Innovation and technological advancements drive the global industry. Firms invest massively in R&D operations to offer differentiated solutions to gain market share. For instance, IRCameras in collaboration with Leak Surveys introduced Nitrous gas imaging IR camera for LDAR market. FLIR Systems launch smartphones with thermal imaging capability to augment product portfolio.